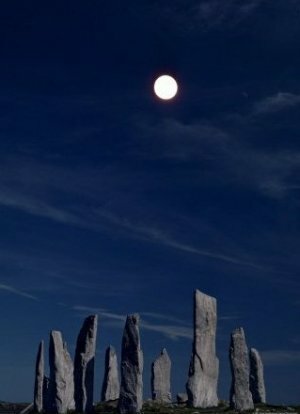 Above is an image of the stone circle called Callanish in Scotland. One of its specific features is that it tracks the lunar standstill, or lunar solstice. In the same way as the Sun every year cycles between its highest and lowest rising and setting, degrees north (summer Solstice) and south (winter Solstice). The Moon also has a similar pattern of highest and lowest rising and setting, or lunar Solstices. This pattern is much longer for the Moon however, as it lasts 18.6 years, compared to the Sun's pattern every year.